ANTIOXIDANTS are substances that fight the harmful free radicals inside the body. They are generally considered as Anti-aging and fight all chronic problems and prevent diseases like diabetes, cancer, etc. Grape Seed Extract is the extract from seeds of Vitis vinifera (both red and green grapes). It is one of the most powerful antioxidants that fights free radicals. It remains in the body for as long as three days whereas other antioxidant carotenoids (even lycopene) is excreted from the body within hours. It is one of the few antioxidants that can penetrate the blood-brain barrier to help protect the brain and nerve tissue that the French people had very low rates of heart diseases is called French Paradox. Studies showed the secret was in their, and further research demonstrated that OPC present in their promotes cardiovascular health. And now, Grape seed extract has been found to contain the richest sources of OPCs (Oligomeric Proanthocyanidins). ASTHAXANTHIN is the unique and powerful antioxidant. Asthaxanthin should be in every antioxidant formulation because it stops antioxidants from becoming 'pro-oxidants'. CoenzymeQ10 is compound involved in making ATP (energy unit) inside mitochondria of cell. It boosts energy, enhances immune system and acts as an antioxidant. 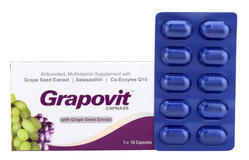 GRAPOVIT® has BIOTIN-a unique Vitamin. Also known as Vitamin B7, Vitamin B6 (Pyridoxine hydrochloride) or Vit. H. Biotin is a coenzyme in the metabolism of fatty acids and leucine, and it plays a role in gluconeogenesis.Biotin is also called vitamin H (the H represents "Haar und Haut”, German words for “hair and skin”). It has beneficial effects on hair and skin. Citrus Bio flavonoids, also being referred to as vitamin P, are a class of flavonoids that includes rutin, hesperidin, quercetin, periodicity and citron and they are essential for the absorption of vitamin C. They are sourced from nuts & citrus fruits like Lemon (Citrus limon), Orange (Citrus sinensis) and Grapefruit (Citrus paradisi). These bio-flavanoids have strong antioxidant activity as well. Antox has Extract of Orange Peel which is rich in Citrus Bio flavanoids. It can be rightly said that despite extensive use of Vitamin C in various Multivitamin formulations, its benefits are lost due to absence of these flavanoids. Antox has Vitamin C combined with Citrus Bioflavoid which helps body utilise the maximum benefits from Vitamin C dose. Promotes blood vessel health, including improving capillary strength. Prevents accumulation of atherosclerotic plaque. Has anti-inflammatory properties acting against histamines. Helps protect against infection and blood vessel disease. Lowers blood pressure by relaxing smooth muscle of cardiovascular system. It lowers cholesterol. Quality tested syrup of grape seed extract offered by us contain in it high quantities of multivitamins and multi-minerals which makes it an excellent tonic for all ages. The extract syrup also has the natural grape taste which makes it preferred for use among people of all ages. Its specially formulated constitution with the high presence of vitamins and minerals provides for natural growth of the body with the presence of multivitamin and multi-minerals supporting the stabilizing absence of vitamins, minerals and all important nutrients in the body. 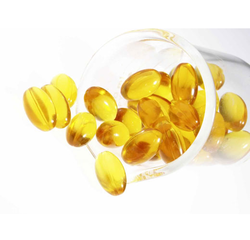 We have a wide range of Antioxidant Capsules for Skin. 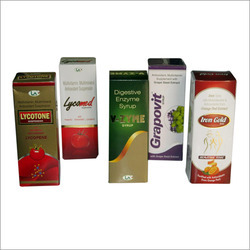 These capsules are tested on different parameters and are very effective.